Ogemdi Ude is a senior in the English department with certificates in Theater and Dance. Last fall, she took The Arts of Urban Transition course in order to learn more about how performance and visual art impacts the communities the work is developed in, and how these artists both hinder and transform urban spaces. Lauren Wodarski is a junior studying Politics, French and Dance from Reno, Nevada. Her concentration is in American Politics, and in urban political inequalities in particular, and it is this interest that prompted her to explore art as a catalyst for urban change and renewal. The story of Detroit is well known: A once thriving ‘motor city’—the fourth largest in the country—now deindustrialized, underpopulated, and struggling to rebuild itself after bankruptcy. Academics are quick to speculate on solutions for the city’s rebirth, tourists visit the ruinous neighborhoods with awe, architects and artists see the city as a blank slate for imaginative proposals. Yet the real story of Detroit goes quietly untold. 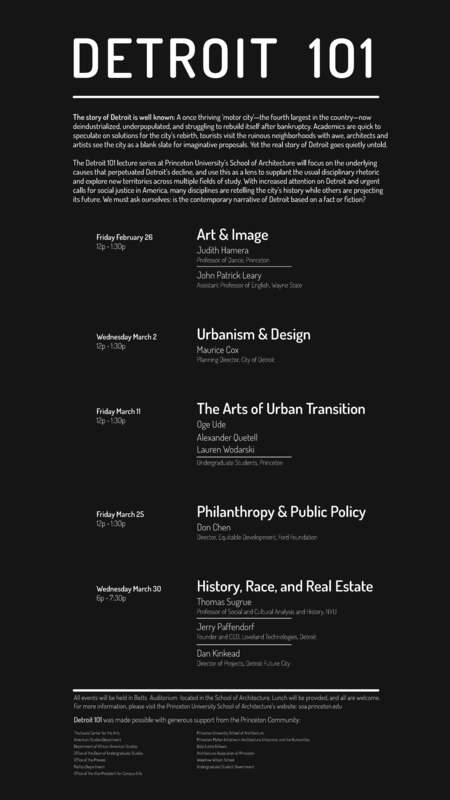 The Detroit 101 lecture series at Princeton University’s School of Architecture will focus on the underlying causes that perpetuated Detroit’s decline, and use this as a lens to supplant the usual disciplinary rhetoric and explore new territories across multiple fields of study. With increased attention on Detroit and urgent calls for social justice in America, many disciplines are retelling the city’s history while others are projecting its future. We must ask ourselves: is the contemporary narrative of Detroit based on a fact or fiction?